Needless to say the recent terrorist attacks against France have affected me deeply. As a citizen of the French Republic; as a proponent of free speech; as a believer in progressive change and non-violent action; as an admirer of the courageous few who, like Charb (Stéphane Charbonnier), state their genuine code of conduct when declaring that they would rather die standing than live on their knees. And as a campaigner for animal welfare, which Charlie Hebdo had rightly elevated to the rank of a struggle for full social justice. In order to measure Charlie's greatness, there was no need to adhere to the entirety of its ideas or to appreciate the whole of its work; it sufficed to recognize the underlying consistency in its condemnation of stupidity and injustice - across religions, races and species. 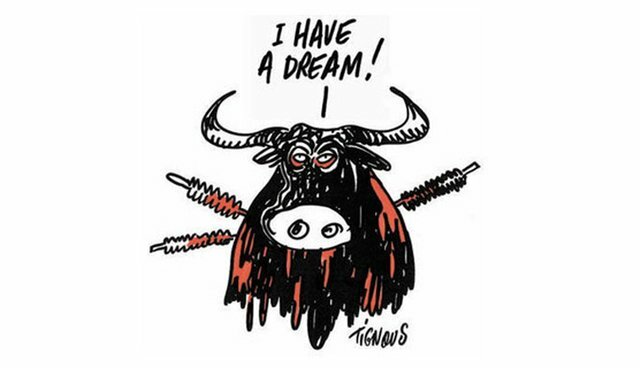 Amongst the drawings that touched me is Tignous (Bernard Verlhac)'s bull, bleeding from the banderillas planted in its sides and proclaiming: "I have a dream!" How brilliant - and in my view, how intensely visionary - to affirm the universal aspiration to live in peace, and thereby our all-encompassing duty of respect, by lending to the animal the voice that Martin Luther King was for black people. Dripping with blood, the drawing tells of the monstrosity of human might devoid of responsibility. It tells of the illogicality and dishonesty of antiracist pretensions which remain foreign to anti-speciesism. It tells of the hypocrisy in calling for the freedom of a people while routinely disregarding that of another, on the basis of our selfish comfort or of the blind habits that have shaped our sense of identity. If Tignous and his colleagues have joined King amongst those defenders of freedom fallen under murderous bullets, it may be that moral progress runs up against resistance not only from oppressors protecting their base interests, but also from weak souls gone astray in their desperate quest for an identity. To the question of how acts of extreme violence could be perpetrated in the name of an essentially peaceful religion, I think that weakness, rather than strength, brings a partial answer. Charlie didn't go easy on its targets, and it was quite natural for the magazine to cause unease, offense or annoyance. But mere drawings shouldn't have been able to affect men in their faith, to the point of pushing them to betray it - unless their faith was deeply fragile, and by definition religious conviction requires a force transcending all material objections. For individuals to violate the principles of their professed religion while claiming to defend it, I feel that an egocentric preoccupation must have prevailed over their faith, and religion primarily served to fill the unbearable void in their identities. I've read that the two killers who struck Charlie had grown up in a violent environment where personal distress and social deprivation compounded each other, and where fundamentalism had eventually become a refuge. Without claiming to decipher terrorism or hatred, I find a lot of sense in the thesis that an intimate fracture, a vital need for self-definition and an irrepressible desire to belong (especially to a group standing in opposition with that from which you found yourself excluded) might provide ideal conditions for recruitment by fundamentalist networks, which divert religion for the benefit of their thirst to dominate. Without making disproportionate comparisons, we have to acknowledge that this identity-related tension operates within each and every one of us, readily blurring boundaries between our convictions and our ambitions. It is therefore difficult to serve to the best of our abilities the causes or ideas that we wish to further, without regularly and honestly enquiring into our true motives. At what point do we confound ourselves with our beliefs or opinions and do we cease to defend them solely on the basis of the value that we place on them, in order to make them tools at the service of our egos? The question proves particularly relevant for those who, like me, have made activism their career choice. In the animal welfare sector, I am privileged to work alongside many passionate individuals who, feeling secure in their expertise, vision and generosity, have little use for a monopoly on legitimacy. However, as in all other areas of life, I also notice energy being wasted as the compulsive need to establish some futile authority stifles the allies who ought to receive support. Welfarists, abolitionists, vegetarians, vegans, ethical meat eaters, employees of such non-government organizations (NGOs) and supporters of such other charities all possess an awareness of injustice which continues to elude the majority of our fellow citizens. Despite this extraordinary community of spirit, it is not uncommon for infighting to take precedence over our shared struggle against the real enemies of justice that are disrespect, lies and ignorance. Egocentricity may manifest itself insidiously, or it may express itself openly and violently. While working with a large animal welfare NGO, I was once made aware of security threats against the staff: to the extremists in our field, who objected to our work with decision-makers and industry players (i.e. with those who have in their hands the fate of billions of animals), we had become the enemy. Men and women whose days were spent advocating for more justice being targeted by so-called righters of wrongs, is somewhat reminiscent of some grievous events. In the wake of the solidarity campaign which spontaneously inundated social networks after the Charlie Hebdo tragedy, a number of deeply cynical articles appeared which denounced the improper comparison made by the now famous "Je suis Charlie." But claiming to be Charlie isn't purporting to share in the courage of its late team; it is affirming our solidarity with them, their loved ones and their ideals. I hope that it is also, by drawing personal lessons from this ignominy, committing to become a better person. Our legacy of columns and drawings leaves no doubt that Charlie Hebdo comprised thoroughly good people. So in order to be worthy of our condemnation of past events, of the present that we advocate and of the future that we wish for, let's strive to improve ourselves, curbing the ambitions of our egos in order to clear the way for our ideas: let's be a little bit Charlie. This goes for me as much as for everyone else, so do hold me to it.